Drop Out Rate Cut by 60% Since Katrina | Educate Now! 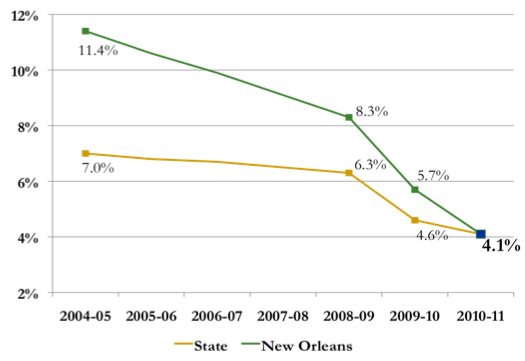 The annual drop out rate1 for New Orleans public schools (OPSB + RSD) has plummeted 60% since Katrina, falling from 11.4% in 2004-05 to 4.1% in 2010-11. At current enrollment, this translates into 900 fewer dropouts per year. We Continue to Close the Gap! New Orleans’ drop out rate is now down to the state average. In 2004-05, we had the state’s third highest drop out rate. Within the RSD, charter schools are succeeding in keeping kids in school, with a drop out rate that is less than the state average. View New Orleans’ drop out data over time 2004-05 to 2010-11. Read more about the falling drop out rate in the Times-Picayune. 1The annual drop out rate compares all students who were enrolled in school as of October 1 in one year and are NOT enrolled as of October 1 the following year. Any student no longer enrolled who does not have a valid exit code (graduated, transferred schools, etc.) is considered a drop out. Some of these students might re-enroll at a later date, so the annual drop out rate may overstate the drop out problem.